To the right of the scripture citation will be a number. Depending on the version of the concordance, it will be either a Strong’s number or a G/K number. (NIV = G/K, Strong’s KJV=Strong’s) Verify which number this is; do NOT just rely on the title of the book. A Greek or Hebrew dictionary which corresponds with the number. There you will find the Greek or Hebrew word, the transliteration and the terms that word has been translated into. A chart which corresponds the Strong’s number to the G/K number and vice versa. Each entry is organized by the translated English word. It includes the word in its original language, transliteration, and corresponding G/K and Strong’s numbers, along with a theological definition of the word. This dictionary does not contain an entry for every G/K or Strong’s number, so if you cannot find yours, try a more specific dictionary. Each entry is organized by G/K number to the Hebrew word, and it includes a transliteration as well as a theological definition. 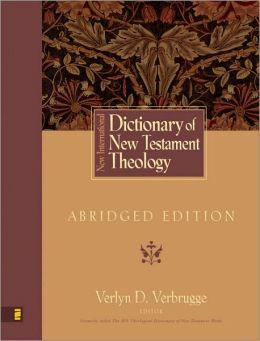 Each entry is organized by G/K number to the Greek word, and it includes a transliteration as well as a theological definition. This is an abridgement of the New International Dictionary of New Testament Theology (listed below), and it doesn’t have an entry for every G/K number, so you may have to use Brown by word. There are two ways to look up your word in this dictionary. Use the index (v. 4) to find your word by its Greek transliteration. First you will need to find the transliteration in the Greek to English dictionary in the back of your concordance, which you can do using the G/K number. Then find your word by its Greek transliteration in the index (v. 4). This will tell you which volume of the dictionary you need to find your word. Look up the English translation of the word in the main part of the dictionary, which is organized alphabetically. You still need to use the concordance to find the transliteration of your Greek word so that you know which part of the dictionary entry refers to your word.